Wes Hoolahan played his final game for Ireland in the World Cup play-off defeat to Denmark last year. BACK IN FEBRUARY, Republic of Ireland playmaker Wes Hoolahan announced his retirement from international football. He bowed out after making 43 appearances for his country at senior level, but the general consensus was that his tally of caps should have been much greater. One of the most gifted footballers Ireland has produced in recent memory, the creative midfielder played a key role for the Boys in Green at Euro 2016. He gave Martin O’Neill’s side the lead in a 1-1 draw against Sweden, as well as providing an inch-perfect pass for Robbie Brady’s winner against Italy. 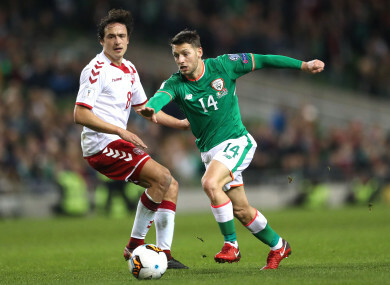 Hoolahan became a prominent player for Ireland during O’Neill’s tenure — he won 35 of his 43 caps under the recently-departed boss — despite not making his first competitive appearance at senior international level until he was 30. The Dubliner was handed his debut by Giovanni Trapattoni in a friendly against Colombia in 2008, but he had to wait over four years to win his second cap. Nevertheless, he’s satisfied with how his international career unfolded. “When you’re playing [international football], you just want to wear the badge and walk out onto the pitch. It’s a great occasion and I really enjoyed it,” Hoolahan said in an interview with Irish Football Fan TV. “Obviously I’d love to have played more times for my country but I never thought I was overlooked. Martin [O'Neill] capped me the most times and I had a really successful spell under him. Hoolahan, who will launch his own football academy in Dublin in January, is now playing his club football with West Bromwich Albion, having spent over a decade at Norwich City. At the age of 36, he has ruled out the possibility of a return to the Ireland set-up under new manager Mick McCarthy, insisting that it’s now time for younger players to be given an opportunity to impress. Ireland’s bid to qualify for the 2020 European Championship begins next March with games against Gibraltar and Georgia. “Hopefully we can get to the Euros,” said Hoolahan. “Obviously there’ll be two games at home so it would be great for the country to be there. It would kind of give a lift after what’s happened in the last year. Email “'I'd love to have played more times for my country but I never thought I was overlooked'”. Feedback on “'I'd love to have played more times for my country but I never thought I was overlooked'”.